For the past ten winters, I’ve enjoyed finessing winter bass with the Ned Rig. It was amazing at how effective Z-Man ElazTech baits like the ZinkerZ and Finesse TRD are for alluring cold-water bass. As the winter of 2016 approached, I was excited to try something new. Even though Z-Man doesn’t have a dedicated line of crappie baits, I wanted to see if ElazTech baits were as effective on cold-water crappie as they are on cold-water bass. Spoiler alert: Crappie love them, too! In a nutshell, winter Midwest crappie fishing is all about locating brushpiles in deep water with your electronics. Usually about 14-18 feet of water. Once the brush is located, vertical jigging with light line, jigs and soft plastics will entice crappie to bite. 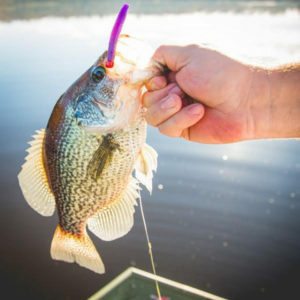 Water temperatures generally range from 34-38 degrees, and that is when crappie congregate in big schools around brushpiles, feeding periodically on schools of shad that meander by. In my region, crappie will bite a fairly large bait, even in winter. A 2.5 to 3 inch bait closely matches our shad size, so I selected a trio of baits in that size range. I’ll tell you more about those below. Throughout the year and until ice-up, these bigger baits caught bigger average crappie, and sometimes MORE crappie than small traditional crappie tubes and grubs. The reasoning is simple. Crappie are sight feeders, which is why you see so many color options in crappie baits. But size can also be used to get their attention. I kept my color selection pretty simple. Just to see how big of bait they would hit, I even fished a Z-Man Diesel MinnowZ, which is a 4″ swimbait! Yep, they ate it. Some days crappie really respond to a bigger profile, and that’s when switching to the MinnowZ filled the livewell. This is a 3-inch swimbait with a much larger profile than the Slim SwimZ. 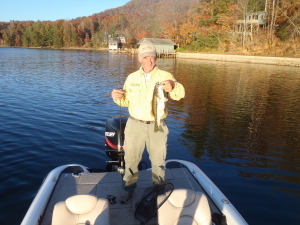 As I mentioned before, I even caught fish on the Diesel MinnowZ, a 4-inch version of the MinnowZ, so it just goes to show that size matters even to crappie! The MinnowZ also fishes well vertically or with a swimming retrieve. You’ll want to use a heavier jighead for this bigger bait. The 1/6 ounce Finesse ShroomZ works very well. The MinnowZ comes in an array of natural and bright saltwater color patterns that are also appealing to crappie. My favorites were similar to the Slim SwimZ: electric chicken, pearl, space guppy, and chartreuse/silver. Yes, the Ned rig works on crappie, too. To be honest, I haven’t had many days when this versatile little rig didn’t catch something. And I found it worked really well fishing brush piles for winter crappie.On days when the crappie wanted a subtler action, I switch to a FinesseTRD or a ZinkerZ cut in half. Rigged on a 1/15, 1/10 or 1/6 chartreuse Finesse ShroomZ, this little bait has tremendous dead stick appeal. Use subtle twitches to entice bites, though many bites will occur while holding it dead still. Colors like Coppertreuse, Pumpkin/Chartreuse Laminate and Bama Craw have vivid color and contrast that really appeals to big slabs. But don’t overlook the plain Pearl color with a chartreuse Finesse ShroomZ. I hope these tips help you think outside the box and harness the ElazTech magic for your winter crappie. Upsizing your presentation and utilizing small swimbaits for vertical presentations can really help fill your livewell with some big slabs. If you’re already a Ned rig convert, you know how effective it is on bass. Be sure to rig one up when crappie are your target, because they love it, too! This entry was posted in Fishing Tackle on December 30, 2018 by ronniegarrison.